Republic Day celebration in Mumbai will take place on 26 January 2019 on Saturday. Here's a complete schedule and timings of upcoming Republic day Parade event to be held at Shivaji Park Stadium to Matunga, Mumbai. You can watch the event live through the bypass roads as soldiers march through checkpoints in the city. Rehearsals of Mumbai Parade 2019 will begin two days before the actual event. Traffic advisory shall be diverted through other roads, so make sure you have the right directions while traveling in the city. The timings shall be from 7:30 am in the morning to 11:30 am. You can check out the complete route for republic day parade event occasion here in Mumbai city. Every year the Government of India in association with the State of Maharashtra organizes a beautiful parade event for the local people in Mumbai. Apart from the actual event in Red Fort, New Delhi where PM of India addresses the nation, our very own Chief Minister addresses to the public on this auspicious occasion. Let's take a look at the brief insights about the Parade event and details of this celebration held every year. Republic Day will put a honour and grace to the public of Maharashtra as Shivaji Park will grace the biggest event to be held in Mumbai. Top persons like Maharashtra CM - Shri Devendra Fadnavis, Ministry of Defence and few Bollywood Actors will grace the morning of National event. Last year Parade saw about 25 tableaux being put on show from various Government officials and Ministries giving their approval. As usual, we shall expect an air force and navy to give thumping joyous views above the skies. Maharashtra's cultural dance and event festival will be organized this year soon after the parade is finished. It is expected that state's tourism and cultural heritage will be given a dominating look with floats of different categories of people to be on display. Vintage cars will be put on show from top owners who have given the authority to drive in the Republic day festival. It will be one of the best days and one freshest morning that Mumbai shall witness that day! This is surely going to built a lot of people as few will be coming from outside as well to view the parade festival here in Mumbai. 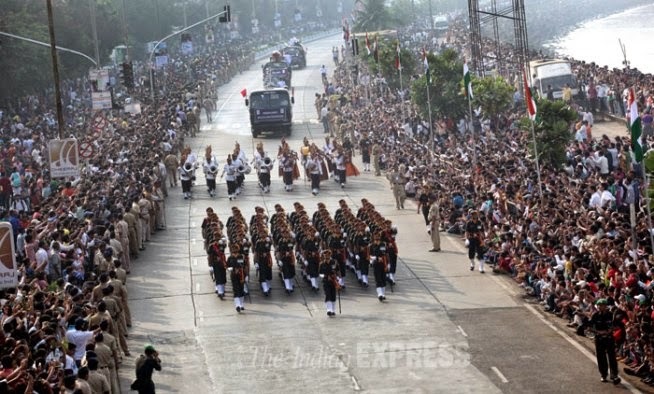 Last year's huge success and grand parade in Marine Drive has let the Government organize another Republic Day Parade event in Mumbai this year. This year it is scheduled at Shivaji Park Stadium on 26 January due to inconvenience at Marine Drive in Mumbai. Here's a complete guide to route details of upcoming parade and how you can watch the live event of parade by visiting the place. Mumbai Republic day parade has always been exciting for us, especially with the nationality and colours of our Indian soldiers. A long parade ride is will start from Shivaji Park Stadium and end in Five Gardens end gate at Matunga. Watch the scintillating parade take its national colours as soldiers march past during the event on a long stretch up to Matunga. It shall start from Maidan Gate No. 4 located at the Stadium end and stretch through points on Keluskar Main Road and N.C.Kelkar Road. The march will go through Kotwal Garden and Tilak Bridge North side and through Tulpule Chowk via Ruia College. It will also pass through Khodada circle on Dadar and give everyone the chance to watch the parade on street. Don't forget to watch this year's parade as Bollywood stars may give an enchanting touch to this year's event surely! Thanks for sharing Republic Day Celebrations information. Republic means the supreme power of the people living in the country and only public has rights to elect their representatives as political leader to lead the country in right direction. Happy Republic Day 2018 I would like to say thank you to give me such a great opportunity our Republic Day.